hen you order coffee, you are concerned about just that one cup - you don’t care about any of the others that are being made and sold. You also don’t care how busy that barista is - you want your order correct, or else. It can be in those final steps before dispensing the final product that obvious errors slip through. They were in a rush, so forgot the shot of caramel you wanted. Like being in a rush to inspect a frame and not noticing some of the paint was coming off before handing it to a patient. These are the last-minute ‘oops’ problems that can be easily avoided, but can cause major issues in how your customer perceives you and your skill level. Developing good habits to maintain quality at every step becomes very important to give your business its daily pick-me-up. uality matters. As an eyecare professional you have spent years honing your craft - learning how to translate your knowledge into the very best experience and visual outcome for your patients. Why would you allow shoddy, inferior lab work to diminish your excellence? After all, your personal brand is on the line every time you dispense a pair of eyeglasses. Statistics demonstrate that up to 50% of eyeglasses manufactured in the United States would not be able to pass ANSI standards. If you are like me, hearing that is startling and revelatory. Not only should YOUR eyeglasses transcend the ANSI guidelines, they should consistently exceed them. As you are assuming that your lab technician thoroughly inspects your finished eyewear, they are at the same time presuming that you will not perform due diligence on the same set of eyeglasses. With all the talk generated around the emergence and disruption caused by the online eyeglass market; it is now more important than ever to differentiate yourself through quality. Accurately verifying the dioptric power of your patient’s lenses is foundational to the final inspection process. ECP’s are generally pretty good at power discernment; wherein, the true “miss” in this area is not following through on the other crucial aspects of eyeglass neutralization. It is never acceptable to verify lens power without first focusing the eyepiece. Even if you are the only optician in your office who uses the lensometer you should still develop the habit of routinely ensuring that your focimeter is focused for your eyes. Secondly, read the power of the lens at the optical center (where there is no prism present). This will ensure the most accurate reading. Along with the dioptric power of the lens, you must also verify that the lenses have been edged to the prescribed axis. Make sure that the eyewear is level on the lens table as you verify the meridian. As you know, even slight axial changes with higher cylinder levels can cause a dramatic shift in one’s vision. Even worse, many times your patient will adapt to these incorrect lenses and not see as well as they ought. Set yourself up for an easy dispense where the patient does not have to overcome unnecessary, peculiar adaptations. All lenses that have dioptric power will have some prismatic effect. As opticians, we must be comfortable with prism and routinely verify either the absence thereof, or that the lenses have been surfaced with the prismatic strength and direction, as prescribed. Many times, we can overcomplicate the prism way too much. With the prevalence of progressive lenses, it is even easier than ever to work with, as we are given a prism reference point. Just view your mires through the reticle and see where they land on the target. Understand that vertical prism in opposite directions compounds, and that horizontal prism in the same direction compounds. Know what effect it will have on your patients when they encounter unwanted prism or a vertical imbalance. This is how you will not only be the subject matter expert, but translate this into customer satisfaction. We spend so much time ensuring that we are at just the right height as we take our vertical decentration measurements (OC, segment height); however, in general, opticians spend far less time ensuring that the finished spectacles reflect this precision. Take the extra minute to verify your OC heights for accuracy, consistency and levelness. Go one step farther and leave the fitting cross on your patient’s lenses as you verify their fit and centration. Doing so will provide a more technical, trustworthy experience in your patient’s eyes, and will also dramatically aide in your final adjustment. Explain what you are doing and your customers will appreciate the extra efforts to ensure that they are seeing their very best. Similarly, we must verify our horizontal pupillary distance measurements. As the eye moves away from the specified pupillary centration, the prismatic effect multiplies. If a 5 diopter lens is off by just 3 millimeters the patient will encounter 1.5 diopters of unwanted prism. One thing to look out for when verifying PDs are lenses with little to no power along the 180 degree meridian. If you have ever tried to verify the PD measurements on a pair of eyeglasses and could not decenter the mires, more than likely it is because there is no power along the 180. The reticle on the lensometer only measures prism strength and direction – and if there is no power to induce prism the mires will stay centered in the reticle regardless of their horizontal position. The good thing is that in these instances the horizontal PD measurement is irrelevant. Bottom line - verify your horizontal measurements to ensure that you are not impairing your patients vision. Do you verify that the lenses are the correct material as ordered? As eyecare professionals we understand the differences in the optical qualities of the various lens mediums; we know that dispensing a polycarbonate lens to a patient that needs CR-39 can have a negative effect. When we contemplate the index, abbe value and specific gravity differences of the multiplicity of materials available to us we begin to realize the importance found in material verification. Most PALs will identify the material on the lens as an engraving. Outside of progressives, the experienced optician will rely on lens pitch and edge characteristics to authenticate. Have you ever received a pair of glasses in and noticed that there was something asymmetrical about the lens shapes? Do not take it for granted that the lenses are the proper profile and circumference. There are quite a few things that can translate incorrectly during the lens tracing process. Be extra watchful inspecting finished eyeglasses for the proper bevel and that there is no discernable roominess or air spaces. Other things to watch include safeguarding that lenses are of the proper color; polished edges are clear and even, and that any coatings are consistent and uniform throughout. After determining that the finished lenses are faultless it is of utmost importance to inspect the frame. Not only do you want to ensure that the frame is not marred, rolled or worse; you must also verify that it is in fact the pair that your patient ordered. Few things will diminish your credibility as fast as dispensing the wrong eyewear. If you are supplying the same frame that was used during the sale, it should be pre-adjusted (since we know this is the only way to achieve accurate measurements). Otherwise, if a new frame is used for the finished eyeglasses be sure that they are bench aligned and ready for your patient. First impressions are everything. Dispensing a new pair of eyeglasses with a nauseating smudge in the center of a lens is deplorable. 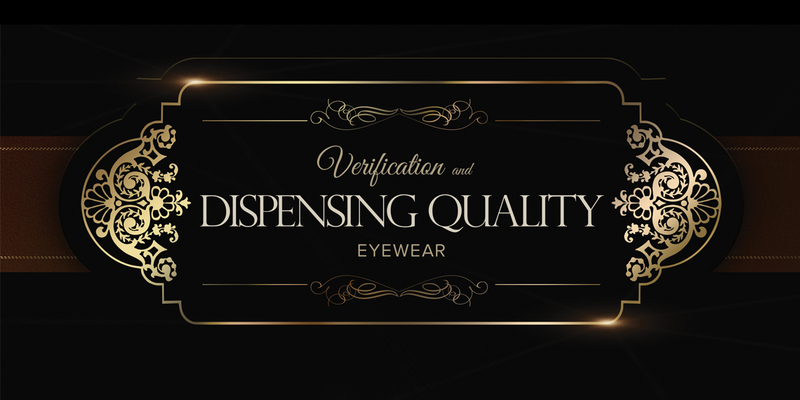 Make the dispense ‘a big deal.’ Provide a case, microfiber cloth and lens cleaner. Restate the benefits of the patients purchase and take the time to showcase the value that you are offering them. Be proud that you critiqued the finished eyewear - knowing that they represent the accuracy and perfection that your personal brand demands. Now may be a good time to ask yourself, “Do I value quality?” Though, I would assume that every eyecare professional would answer this reflection with an emphatic, “Yes!”, the truth is that our values are reflected in our opticals and in the eyewear that passes through our doors. Evaluate the current system that you are using to scrutinize your specs. Where does it fall short and how can you adjust to make necessary changes? Improve your quality. 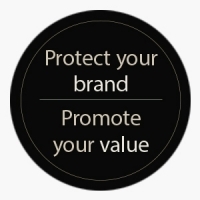 Protect your brand. Promote your value.